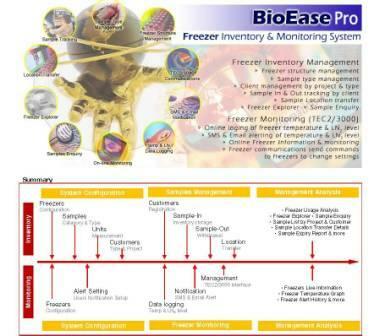 BioEase Basic is a powerful system that is designed to cater for the freezer inventory management. It allows the user to define the types of freezer or tank storage that are being organized by freezer racks, levels and slots. BioEase Basic tracks the client’s samples by Sample In transaction with multiple samples storage per client and automatically locates the next available location in the freezer for you. User can withdraw multiple samples simultaneously from freezers by using client’s id via the Sample Out module and the location will be available for other samples storage. With the Sample Enquiry function, it lets you search for the client’s sample from the freezer easily and the Freezer Viewer allows the user to monitor the freezer usage at a glance. 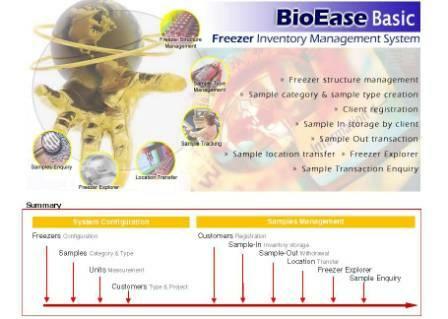 BioEase Basic puts you in control of the freezer structure by managing thousands of frozen samples. It helps you to minimize your paperwork and increase your productivity at work. With its powerful features, it fits the way you want to manage and monitor the samples in the freezers.Call or Email us for a Demo. BioEase Pro system is the software that design and cater for the Freezer inventory management It allows user to define various type of Freezer storage that organized by freezer racks, levels and slots. The system allow user define various type of sample category, sample type, project and user access security control. Sample tracking allow user to capture the customer samples storage with multiple sample type and the capture the sample out transaction by full or partial sample used. Freezer Temperature tracking allow you to capture the freezer temperature as and when for audit and report management. The management reports allow you to analyse the Freezer usage report, Customer Sample analysis, Sample Type report & etc. 1. Security – To define various security access group. 2. User – To define the application user and their access rights. 3. Customer – To setup new customer and their detail information. 4. Freezer – To setup the freezer storage inventory by multiple racks, levels & slots. 5. Project – To define the various project for the customer sample. 6. Sample Category – To define the sample category such as blood, tissue & etc. 7. Sample Type – To define the detail sample type such as liver tissue, lung tissue & etc. 8. Unit Measurement – To setup the unit of measurement such as milligram, mililitre & etc. 1 Sample In – Allow user to capture the customer sample in transaction and select the available freezer storage. 2. Sample Out – Transaction to capture the out going sample either full or partial. 3. Freezer Temperature – To capture and monitor the freezer temperature. 4. Sample Location Transfer – To trace the change of location of the sample from 1 rack to another rack or even different freezers. 1. Freezer Alert Setting – Allow user to define the range for the Temperature A, B and LN2 level and SMS & Email alert up to 5 users per freezer. 2. Freezer Management – Allow user to send command directly to the TEC2000/3000 controller for query or setting of the controller. 3. Freezer Information – To view the freezer information online by freezer usage, Temperature & LN2 level. 4. Freezer Temperature History – To view the Temperature A, B and the LN2 history. 5. Freezer Alert History – To view the alert history by freezer. Monitoring for other freezers using remote probes, controllers and data transmitters also possible. Contact us for more information. We are able to customise the software to your laboratory or accreditation requirement (additional charges apply).